Basement of Ghoulish Decadence: Dude I love Cheez-Its! Well this is a first! 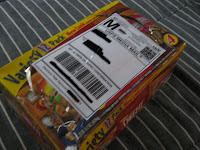 I can't believe the Postal Service accepted this kind of packaging--a variety box of Keebler Rainbow cookies, Fudge Stripes, and Cheez-Its snack packs with a Media Mail label slapped on the top. Unfortunately, no packs were included, but what was inside amazingly survived intact. Magnum's clamshell of Stu Segall's 1977 drive-in massacre opus, Drive-In Massacre.